It’s finally freezing and that means it’s time to get the perfect winter coat for this season that is fashionable but will also keep you warm! Of course, there’s the classic down coat, but there are so many other options to choose from that will keep you just as warm and look a little more stylish. Whether you are into neutral tones, animal prints or bright colors, there is the perfect coat for you out there. This list is here to help you find your new winter coat for this year’s winter season. Corduroy puffers is an upgrade to the classic puffer with cool colors and textures, you can find one to pair with your style. Whether you prefer a more neutral color like a deep moss green or you find yourself reaching toward the ever trendy neon colors, a corduroy puffer is a fun take on what you grew up wearing. These never really went out of style, but this season they are especially in. A camel peacoat is a closet staple. You can dress it down or up and it will pretty much pair well with every single thing in your closet. If your wearing jeans and a cute sweater, throwing this coat over that outfit will no doubt make you look chic and put together. If you have night out on the town you could also pair this with a dress and pumps. The long length will pair well with a dress while also allowing you to show off some leg and still keep you warm. You really can’t go wrong with this classic. Animal print is all the rage this season and so is faux fur. This coat is the perfect combination of this season’s hottest trends. Just think cozy and cute!! They come in both long and short lengths along with a number of animal prints. Although, this season, it happens to be all about Leopard, so you will certainly find the most of those. And this coat if perfect for those for fur or against it because these are faux. 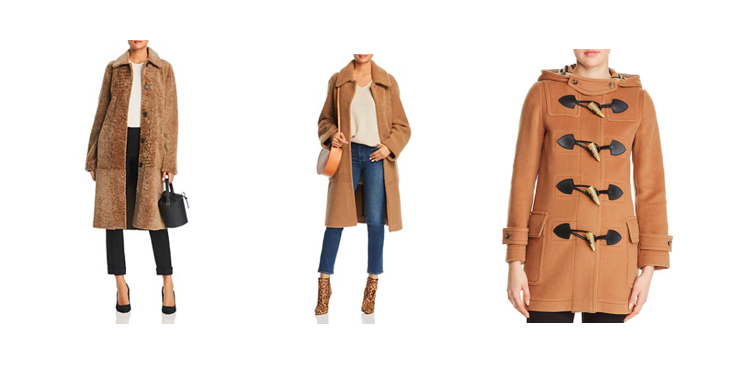 These coats are like getting a hug from a teddy bear when you wear them. Soft and stylish, you probably don’t own one of these from previous seasons. This style of coat just became popular this season and once you put it on you’ll never want to take it. They are just as soft (maybe eve softer) on the outside than they are on the inside. Coming in a variety of colors, you’ll be able to find one that best matches your personality and style along with ones that are fit for any and all occasions.